What's with the title of this article? At best, a pretty poor choice of words - or was it always intended to be derogatory? Not intended to be derogatory at all. How could it be? You know I'm always a firm supporter of your work. Regardless, I changed the title. Apologies for any unintended upset caused. Unfortunately, coppers are subjected to the term ‘police dog’ or ‘pig dog’ as an insult from drunken fools from time to time. I thought the original ‘four legged police dog’ title may have inferred that he was a four legged police dog as opposed to a two legged one. See what I mean? Thanks for altering it, and thanks also for you ongoing support Mike. 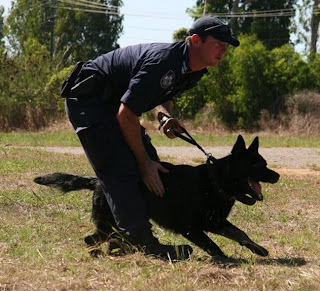 I've never heard the term ''police dog'' and certainly would never suggest anything of a sort ! It was a humourous attempt (which failed in your mind!) ... a Monty Python type reference (which I grew up on rather foolishly!) where you state the bleeding obvious - i.e. a four legged dog. So I can assure you I'm no drunken fool and never knew about the term at all. Maybe I must get out more.